Can you feel that? It’s the excitement starting to mount for San Diego Comic-Con this weekend, where AMC will finally – finally! – peel back the lid on season 8 of The Walking Dead by revealing the first trailer. It’s the moment that fans have been waiting for ever since the last season wrapped up back in April and with promises of all-out war and a much faster pace and more action, there’s many things to look forward to when the show returns. But there’s another important reason why you should be tuning into The Walking Dead when it makes its comeback this fall, and that’s because the hit series is about to reach a significant milestone by airing its 100th episode. A huge achievement and something that all involved should be mighty proud of, AMC’s now decided to put together an awesome new poster to celebrate the occasion, and you can check it out below. The banner was spotted today hanging inside the San Diego Convention Center, where Comic-Con will take place later this week. Thanking the show’s legion of fans while teasing the new season, what’s so great about this piece of promotional material is that not only does it show the evolution of Rick, which is cool to see, but it brings back a ton of old characters. To the left of season 1 Rick we get The Governor, Lori, Sasha, Glenn and more, while the other side features some of the newer faces, like Negan, Ezekiel, etc. There’s nothing here that provides any clues as to what we may see in season 8, but it’s a nice way to celebrate 100 episodes and should definitely please those fans who’re making the trip out to the convention this year, as it’s nice to see some familiar faces who aren’t with us anymore. Not to mention that the banner also brings back memories of several of the show’s best moments. 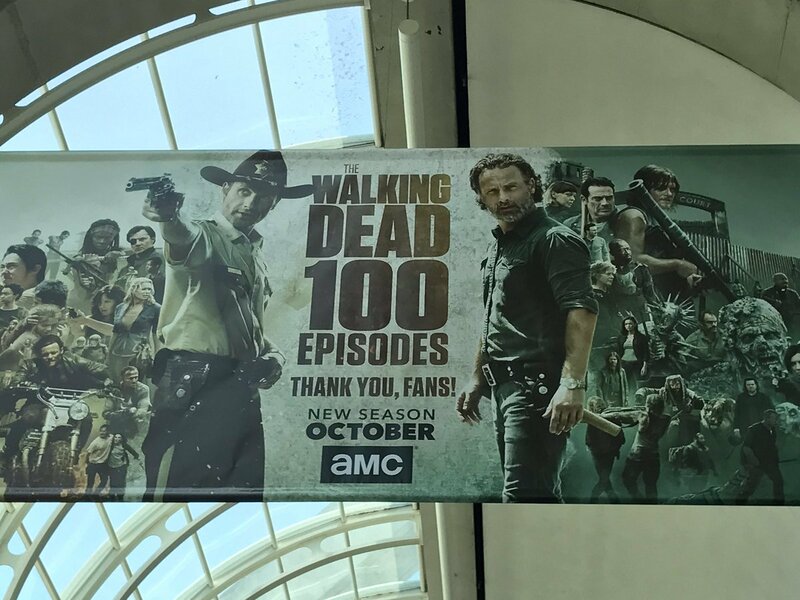 With Comic-Con now on the horizon, expect The Walking Dead news to start pouring out at an alarming rate, but until the panel gets underway on Friday morning, feast your eyes on the banner above and be sure to drop us a comment with your thoughts on it.